Then, we dove into dinner, with a couple of appies to share. 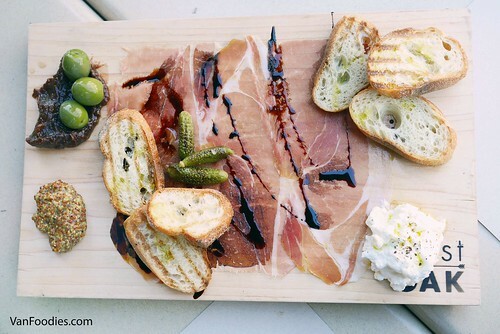 Burrata & Prosciutto is great for sharing. The burrata was rich and creamy, prosciutto had just enough salt. Both went on a piece of oil-drizzled grilled bread plus a dabble of fig jam and mustard. 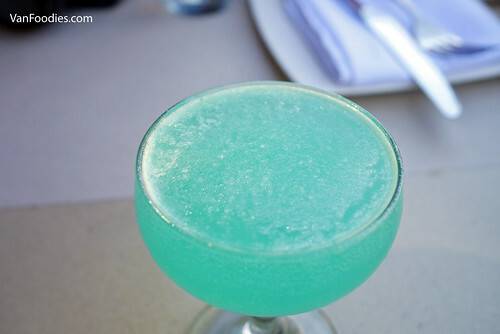 It would go perfectly with a glass of rose on any patio. I’m not a fan of olives so I didn’t have any, but Alice said the castelvetrano olives were quite good. 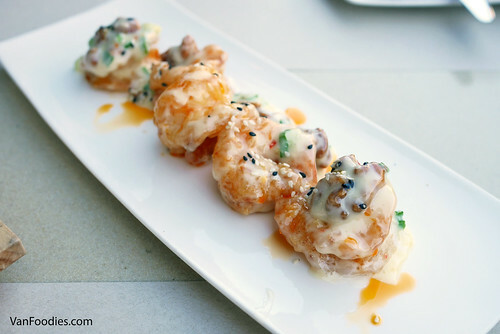 Chinois Prawns reminded me of a dish I sometimes order at Chinese restaurants called honey walnut shrimp 合桃蝦. There were five battered prawns, deep fried then tossed in their housemade spicy aioli and candied walnuts. These were not as sweet as the Chinese version. The prawns were seasoned well, and the aioli had just a hint of heat in it. I’m also a huge fan of ebimayo so I could eat a lot of these. For entrees, we had three plates to share. First, Fresh Wild Scallops, came with sweet pea and mint risotto, asparagus, white balsamic reduction, and parmesan crisps. The scallops were cooked nicely. They had a nice caramelization on the outside, yet sweet and just a bit of pink inside. 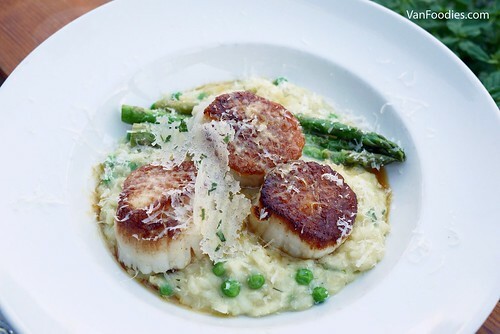 You don’t want overcooked scallops. The risotto was creamy and I liked the addition of peas and mint. This dish was probably on the heavier, richer side. 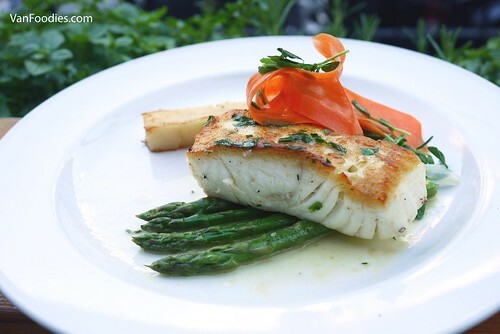 On the other hand, the Seared Halibut is great for this weather. It’s light yet flavourful. Halibut is a meaty fish, but I really enjoyed the crust on the top and the flaky flesh with the lemon butter sauce. 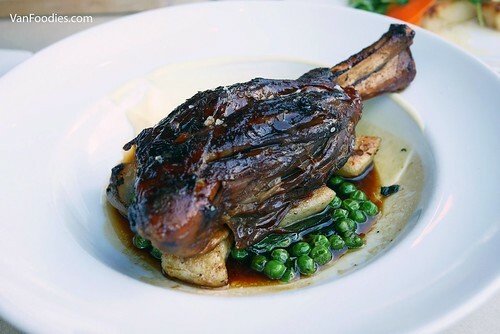 The Braised Lamb Shank was definitely the richest entree of the three. I’m a sucker for anything lamb, and this was no exception. The meat was tender and fell right off the bone. The sauce was rich and luscious; gnocchi was pillowy. It’s a big portion too, especially considering it’s priced at only $24. 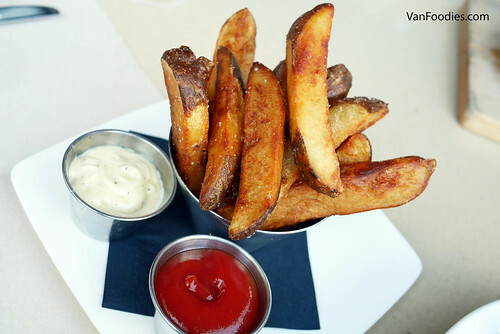 The Triple-Cooked Fries not only were cooked three times, but it also took three days to cook. They were crispy, crunchy on the outside, yet creamy and fluffy inside. Such a big textural contrast! We were quite full by this point but I really couldn’t stop munching on these; of course, there was also truffle aioli for dipping. The Lobster Mac & Cheese could be an entree on its own. 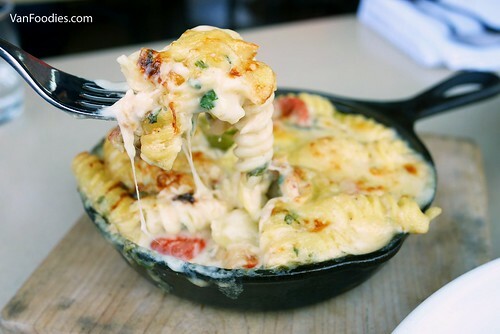 It’s a three-cheese mac & cheese, so it was rich and creamy, and luxurious with the addition of lobster chunks. There was a good amount of lobster in the dish. Makes great comfort food. Lastly, to wrap up our meal, there were Fresh Baked Chocolate Chip Cookies – 3 white chocolate chip cookies and 3 dark chocolate chip cookies. 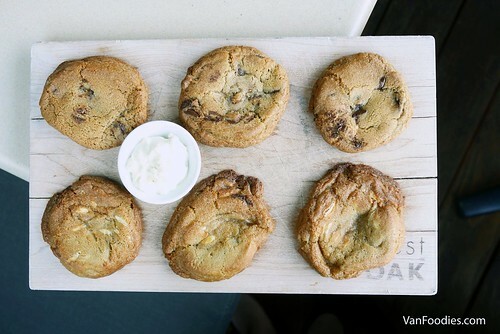 These are made to order, but fresh cookies are worth the wait. It’s soft and chewy, and you can see the melted the chocolate chips as you break the cookie in half and pull. The cookies came with a vanilla bean cream, in which you could see speckles of vanilla bean. As much as vanilla goes well with cookies, I didn’t think the cream was necessary. Truthfully, I always remembered West Oak being on the pricey side. However, this dinner has changed my mind. 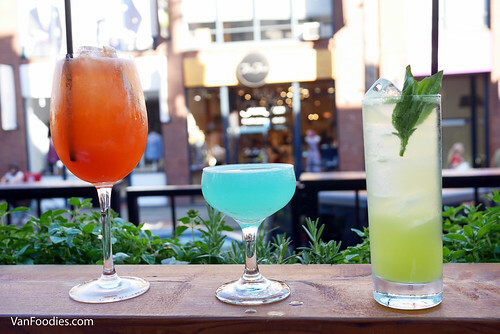 Consider the portion size of each dish, against its price tag, I thought West Oak is relatively affordable. Sure, it’s not your everyday go-to for dinner. But for a nice dinner out, this sure wouldn’t break the bank. I’m curious about its happy hour menu, too.